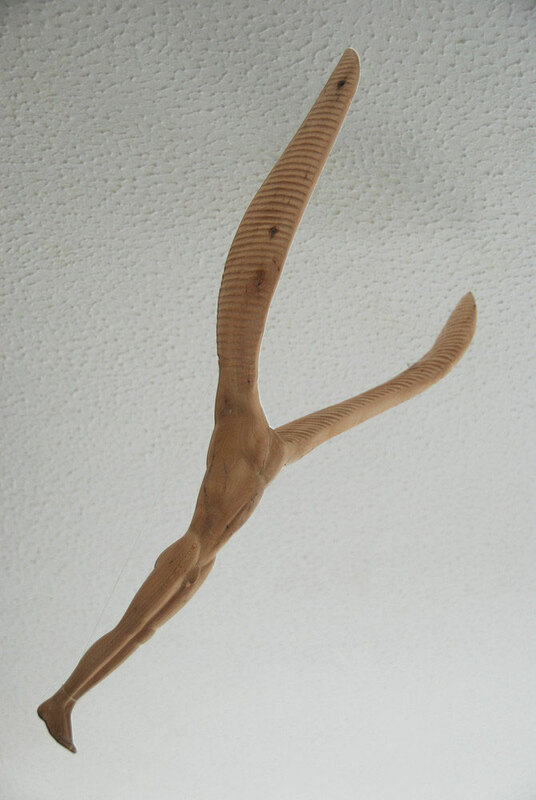 A suspended winged headless man made out of a piece of wood from a Bay tree I was remodelling in the garden. Rough carved out of very wet wood and then left to dry out before adding detailing. Difficult to display other than from a ceiling with fishing line. Difficult to photograph. 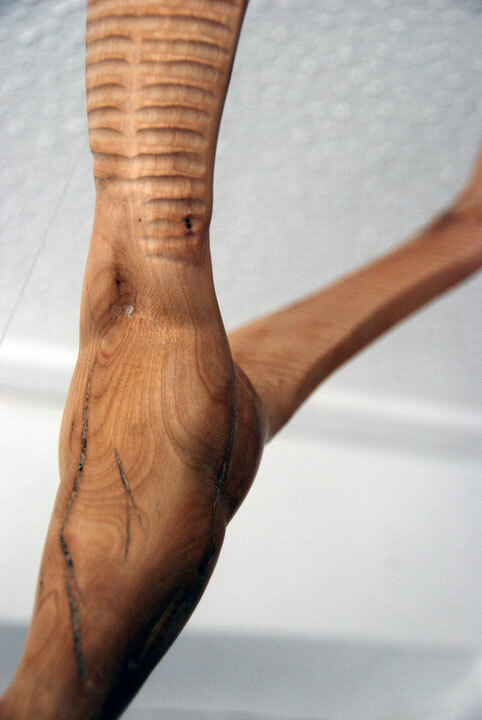 It uses the natural curves of the forked trunk I cut out of the living tree and it evolved out of that form. But it was never 'in there' waiting for me 'to find it out'. It never is. 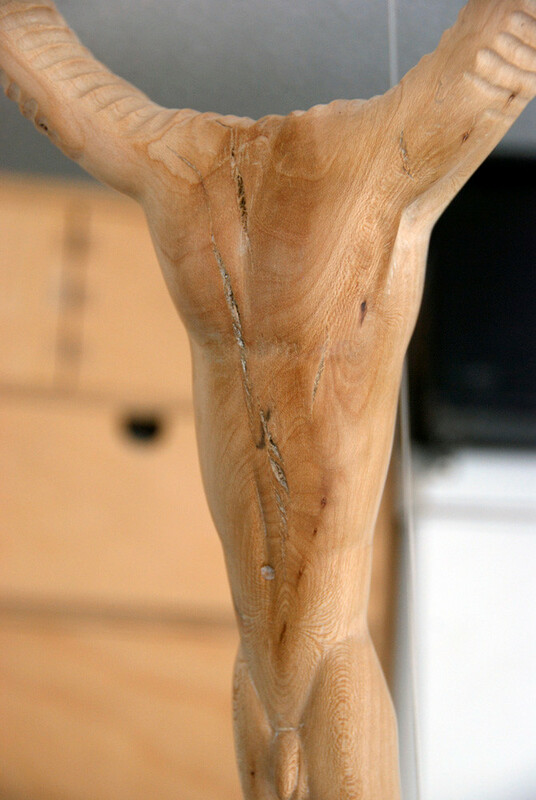 It's a dialogue between me, and all the junk I have in my head and all the dexterity I can draw out of my body, the tools and techniques in my possession and the form, structure, grain, water content, etc of the piece of wood. And it all develops over time, shifting and changing, running up againt limits (like there being no wood for a head) and finding ways round them (like not having a head). 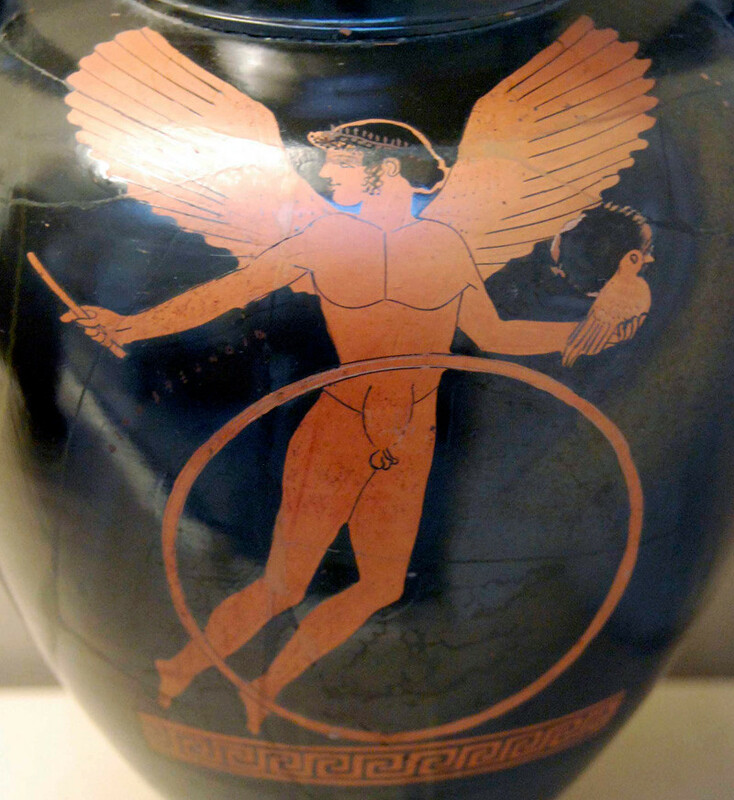 If there was an inspiration in 'all that junk in my head' I think it was the depiction of Eros on a Greek vase in the British Museum (see photo below). 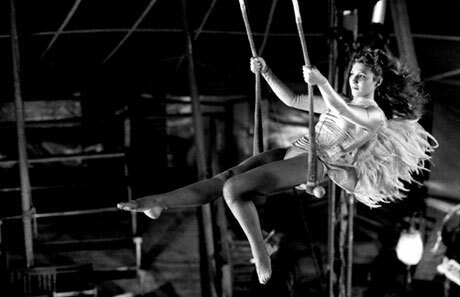 I also loved Wim Wenders' film, Wings of Desire and somewhere in my mind there was a crossover between the very earlthy angels - played by Bruno Ganz and Otto Sander and the lovely, lonely trapeze artist, Marion, played by Solveig Dommartin (see photo below) who died in 2007 at the age of 45 of a heart attack (not that I knew this at the time of making the piece). In the film she tempts the angel played by Bruno Ganz to trade his wings for life and mortality (see Variety Obituary and Guardian Obituary). It's not that I had either of these influences in my mind's eye whilst making the piece. But looking back on it now I can see how they maybe predisposed me to follow certain paths rather than others - they maybe conditioned a kind of force field of excitement and emotion that came into play as the piece developed. A funny thing happened to me in Berlin (as they say). I had had a long day walking around parts of the Wall and was eating some very late lunch at a little Italian place. I was sitting at a table on the pavement and got chatting to a woman who sat down. At a certain point she asked to excuse herself because she had an important appointment 'with the film director, Wim Wenders, you know of him, yes?' who was sitting at the table behind us.